Until recently, Pierre Bonnard’s paintings have been covered by copyright, and inaccessible to the blogger. With the release of images of hundreds of his paintings and photographs into the public domain, it gives me great pleasure to show a small selection in this new series. Bonnard (1867-1947) is one of the most individualistic and fascinating artists of the end of the nineteenth and early twentieth centuries. Best-known for his sparkling gardenscapes of the south of France and obsessive intimate paintings of his wife, he is my favourite post-Impressionist alongside Vincent van Gogh. Born the son of a senior civil servant, and living in an affluent suburb to the south-west of Paris, he underwent a classical education and progressed to study law. In the late 1880s he also started attending classes at the Académie Julian, and at the École des Beaux-Arts in Paris. He started practising as a barrister once he had graduated, but quickly abandoned that career to be an artist. Pierre Bonnard (1867-1947), In the Countryside (Grand-Lemps) (c 1888), Oil on cradled panel, 27.9 x 22.9 cm, Private collection. The Athenaeum. Bonnard’s family appear to have owned a property in Le Grand-Lemps, in the south-east of the country not far from the city of Lyon. 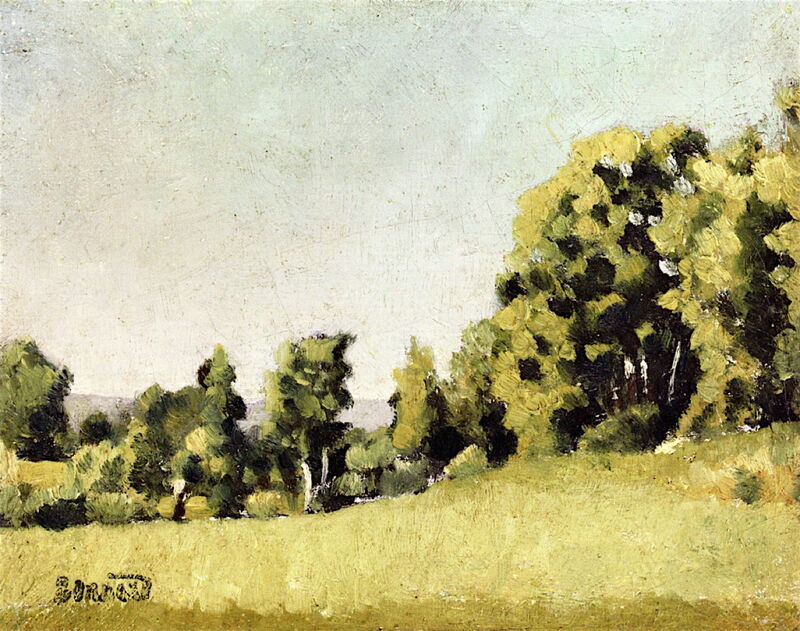 Among Bonnard’s earliest surviving paintings are several landscapes painted in this area, including In the Countryside (Grand-Lemps) from about 1888. 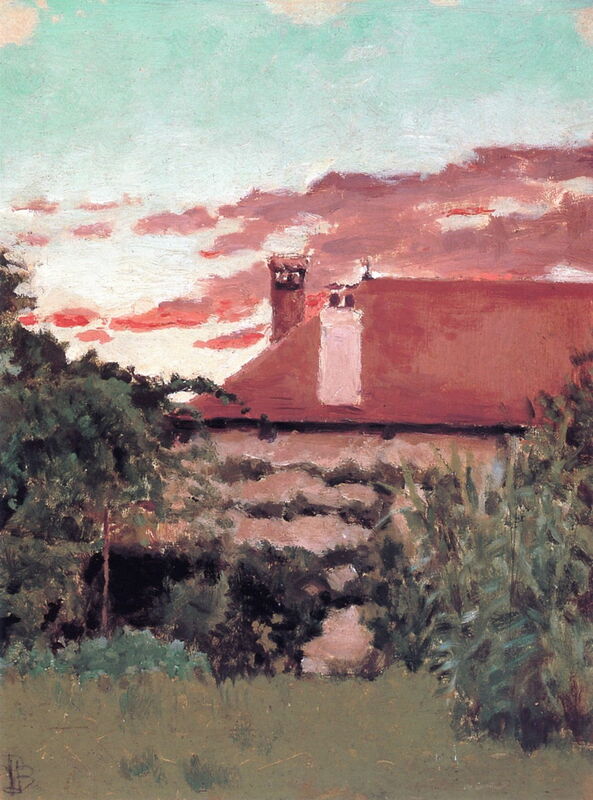 Already he had started to use quite high chroma colours, as seen in this sunset view of a house there. Pierre Bonnard (1867-1947), Landscape of Dauphiné (c 1888), oil on canvas, 19.3 x 24.1 cm, Private collection. The Athenaeum. Le Grand-Lemps had been transferred to the Isère Department during the French Revolution a century earlier. This Landscape of Dauphiné, also made in about 1888, was presumably painted when he was staying in that town. 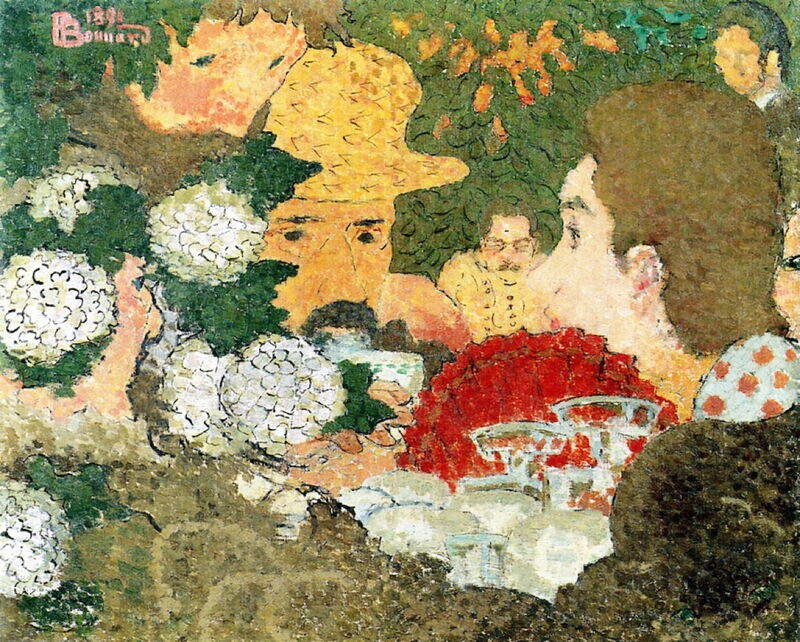 Japonisme was all the rage at the time, and soon came to dominate Bonnard’s early paintings. He came to admire panelled screens which were widely shown at the time, and which he adopted for several of his first significant works. Probably the earliest of these is this exquisite three-panelled screen of The Stork and Four Frogs completed around 1889. 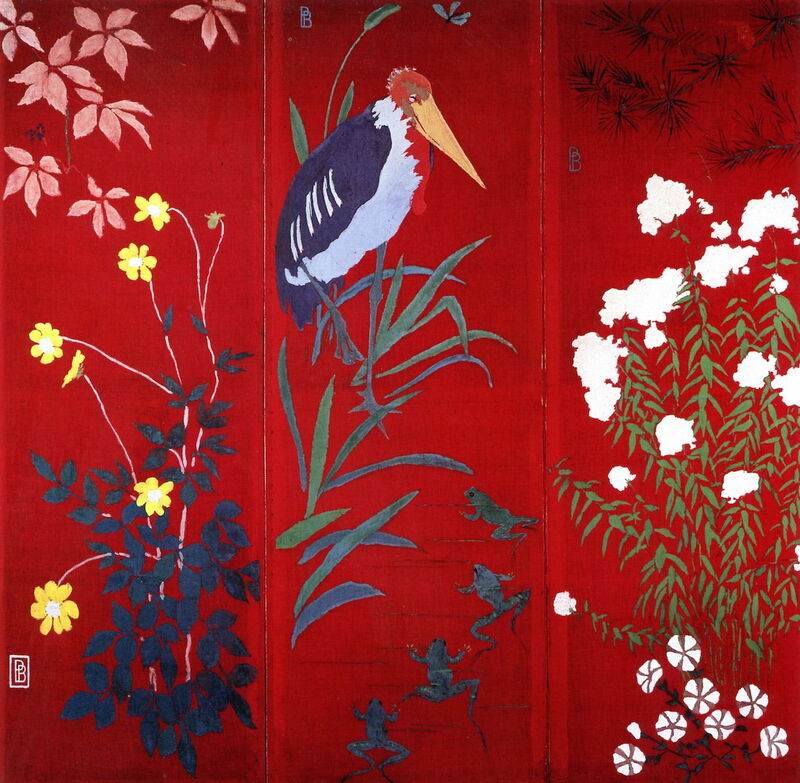 To mimic the appearance of east Asian lacquerware, Bonnard painted this in distemper on red-dyed cotton fabric. Its story is, though, thoroughly European, based on the fable retold by Jean de la Fontaine of The Frogs who Demand a King. This has a long pedigree, being first recorded by Phaedrus in the first century CE, and attributed to Aesop. Remarkably, Bonnard did not try to exhibit this screen, but gave it to his sister. 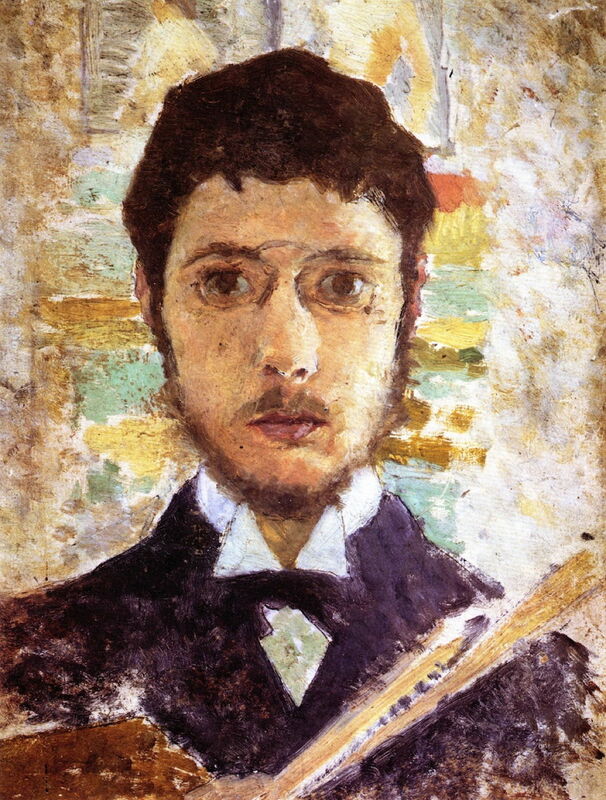 Pierre Bonnard (1867-1947), Self-Portrait (1889), tempera on panel, 21.5 x 15.8 cm Owner/Location: Private collection, Private collection. The Athenaeum. Also dating from 1889 is his first Self-Portrait, which he painted in tempera on a panel. 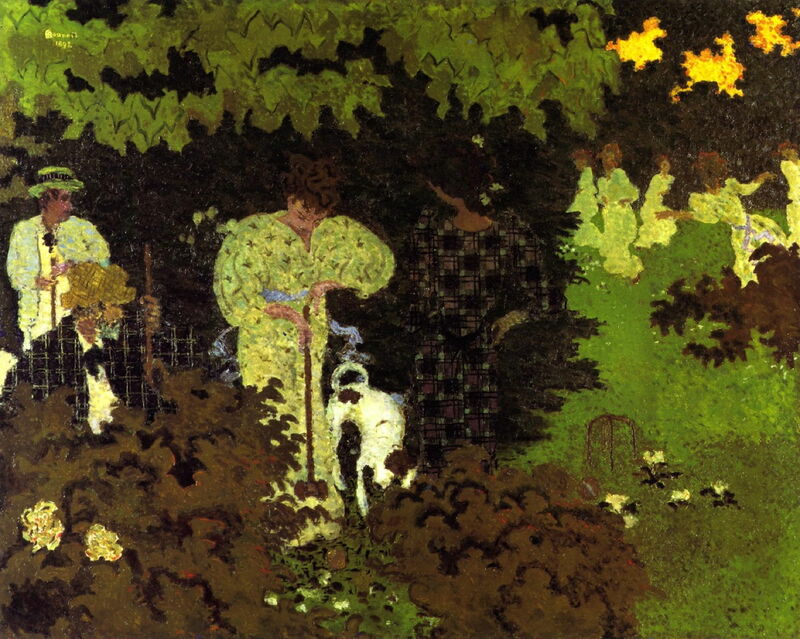 This shows the influence of his new group of friends, which included Édouard Vuillard, Félix Vallotton, Maurice Denis, and Paul Sérusier: the Nabis. Formed when they were still students at the Académie Julian in Paris, they took their name from a term coined by a linguist to describe their aim of rejuvenating art in the same way that the ancient prophets had rejuvenated Israel: nabi was derived from a Hebrew and Arabic word for prophet. Although their style lived on in the work of former members of the group, like the Pre-Raphaelite Brotherhood, the Nabis soon started to break up, by about 1896. Pierre Bonnard (1867-1947), The Street (1889), oil on panel, 26.8 x 17 cm, Private collection. The Athenaeum. 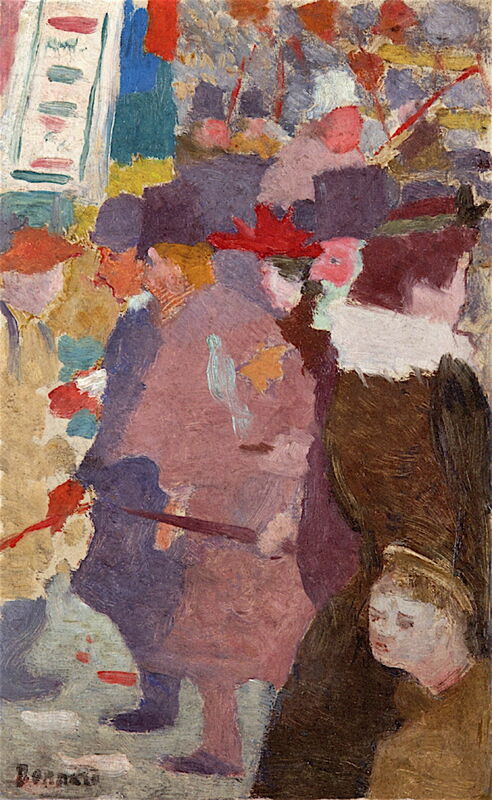 Bonnard also started to paint street scenes, such as The Street in 1889, in which the figures are overlapping areas of colour. Pierre Bonnard (1867-1947), The Dressing Gown (1890), oil on quilted canvas, 154 x 54 cm, Musée d’Orsay, Paris). The Athenaeum. A little later, in 1890, he returned to his vertical panel format, in The Dressing Gown. This incorporates decorative elements, in which pattern rather than colour or outline is used to distinguish figure from ground. Pierre Bonnard (1867-1947), Afternoon in the Garden (1891), oil and pen and black ink over pencil on canvas, 37.5 x 45.1 cm, Private collection. The Athenaeum. 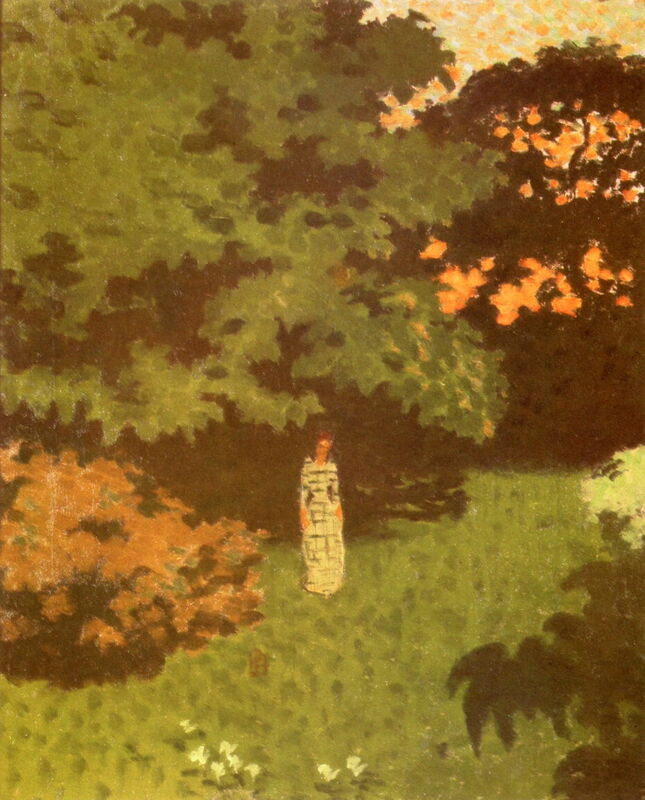 Bonnard’s Afternoon in the Garden from 1891 shows his intense innovation during these years with the Nabis. Working in oil with pen and black ink, he has here successfully combined colour and patterning in an image which has lost all depth, but retains clear pictorial structure. Pierre Bonnard (1867-1947), Woman in the Garden, panel 1 (1891), oil on paper mounted on canvas, each 160 x 48 cm, Musée d’Orsay, Paris). The Athenaeum. Pierre Bonnard (1867-1947), Woman in the Garden, panel 2 (1891), oil on paper mounted on canvas, each 160 x 48 cm, Musée d’Orsay, Paris). The Athenaeum. Pierre Bonnard (1867-1947), Woman in the Garden, panel 3 (1891), oil on paper mounted on canvas, each 160 x 48 cm, Musée d’Orsay, Paris). The Athenaeum. Pierre Bonnard (1867-1947), Woman in the Garden, panel 4 (1891), oil on paper mounted on canvas, each 160 x 48 cm, Musée d’Orsay, Paris). The Athenaeum. Later that year, Bonnard announced his intent to paint “a screen that will also be an exhibition”, which became his first major work and brought him critical appreciation: a four-panel screen titled Woman in the Garden (1891). This finished version in oil on paper mounted on canvas was exhibited as his debut at the Salon des Indépendants in 1891, and later that year was shown at a gallery too. It is now in the Musée d’Orsay in Paris. Bonnard’s four panels are separate paintings, rather than the continous image of The Stork and Four Frogs. Each shows a young woman dressed in the latest fashion, with rich colours and patterning again. Bonnard also left his studies for this work, and appears never to have been entirely happy with the result. However, the critics were laudatory, and they launched his career as an artist. Pierre Bonnard (1867-1947), The Croquet Game (1892), oil on canvas, 130 x 162.5 cm, Musée d’Orsay, Paris). The Athenaeum. Bonnard continued to paint in Nabi style, albeit with a strong Japonisme. The Croquet Game, from 1892, is less crowded than Afternoon in the Garden, but no less Nabi. Pierre Bonnard (1867-1947), Young Woman in a Landscape (or Madame Claude Terrasse in the Enclosed Garden at Grand-Lemps) (c 1892), oil on canvas, 43.2 x 35.3 cm, Private collection. The Athenaeum. He painted at least two versions of Young Woman in a Landscape, sometimes known as Madame Claude Terrasse in the Enclosed Garden at Grand-Lemps, from about 1892. In this version, the woman stands out by virtue of the colours and patterns of her clothes; in the other she too is green, as is her entire background, which makes the figure very difficult to distinguish. Posted in General, Life, Painting and tagged Bonnard, Denis, japonisme, Nabis, painting, Sérusier, Vallotton, Vuillard. Bookmark the permalink.